Whereas, we all already heard about the Kabali Movie Release date. Though, we shared that too here. The Movie release date of Rajini’s Kabali is July 1, 2016. The Kollywood superstar, Rajinikanth’s upcoming Tamil, Telugu, Hindi, and Malay language movie. Whereas, it is the first Tamil film which is dubbed into the Malay language and set to release in Malaysia. The Production department was taken actions about the promotion of this movie. Initially, the Kabali Movie Teaser was published on May 1, 2016. The teaser is creating YouTube Viewers Record. Now, the Movie Audio Songs track list was released. But, recently we all heard the news of RajiniKanth’s visit to America with his family. It is the first time, were he stayed there as long time. So, the production department is not going to organize a big audio launch for Kabali. So, the Kabali audio songs would be directly launched via online on June 12, 2016. The Think Music has bagged the Kabali Audi rights for Tamil, Telugu, and Hindi. The Kabali Teaser crossed the 20 Million Views on May 28, 2016. The Producer of Kabali, Kalaipuli S Thanu tweeted about this record via his Twitter account. The Kabali music was composed by the Recent popular music director, Santhosh Narayanan. 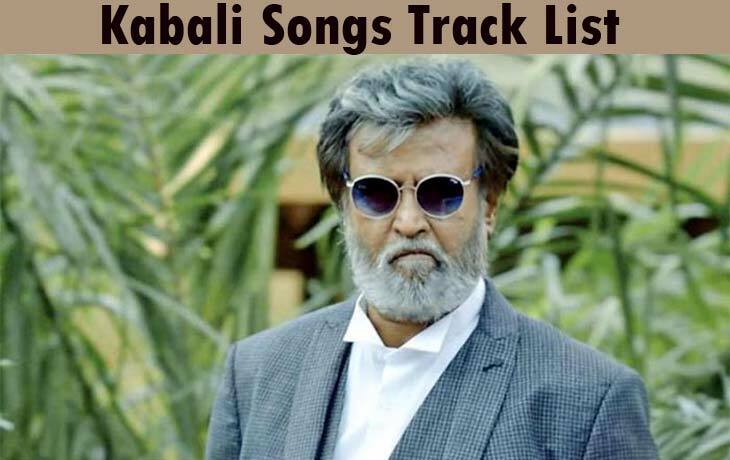 Whereas, the Kabali Sing lyrics are penned by the Tamil lyricist Kabilan and Uma Devi for the total five songs. The Kabali Audio Songs Track List poster was designed with the complete details about Lyricist, Singers, Music artists and other unique things. Scroll down and View the Kabali Tracklist Image Poster. The fans and other audience have huge expectations about this Kabali as Rajinikanth is making his presence on BIG screen after two years of gap.